Three Angels provides a number of opportunities for Haitian men and women to earn sustainable income for their families. Job creation works to interrupt one of the primary factors involved in families relinquishing their child to an orphanage: lack of income. Most children in orphanages in Haiti are there because a parent was in a desperate financial circumstance. We feel relinquishment is a choice one should never have to make. A source of income can mean the difference between an orphan and an intact family. Three Angels Staff. We are not only employing parents, we are raising up leaders. Our staff and leadership are primarily comprised of local Haitians (over 48 on staff) who are trained to manage our core programs that include education, medical, orphan care, and economic development. BIJOU Three Angels Jewelry. 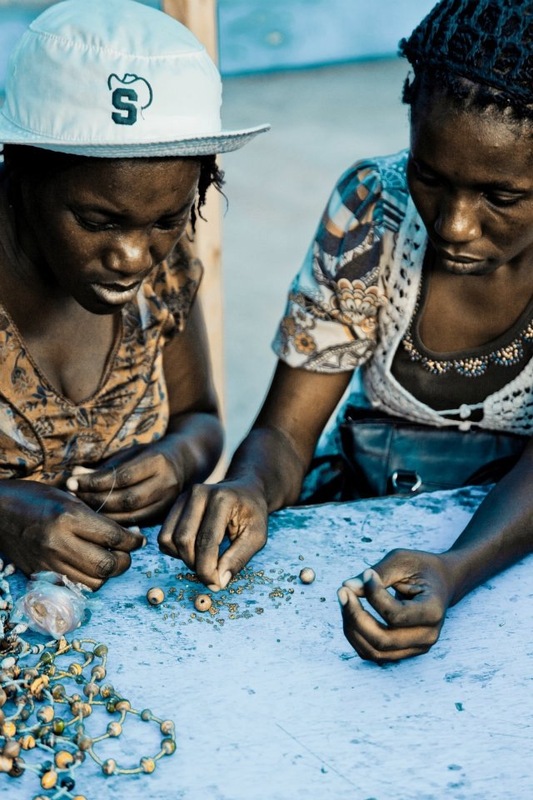 Each piece of BIJOU is hand-crafted by our Artisans in Haiti. They were trained under the direction of The Apparent Project. Our Artisans have learned to cut, roll and lacquer paper into quality beads; each piece being as unique as the woman who made it. Jewelry is available for purchase at our guesthouse. The Farm at Three Angels We have partnered with Trees That Feed Foundation to provide breadfruit and other environmentally conscious trees for families in Haiti. These trees provide high nutrition as well as opportunities for families to commercialize for added income.